“Heathers” is a 1988 cult classic movie that centers around four girls at an Ohio high school who are dealing with the plight of being a high school student. It was first produced on stage in 2010 and moved to Off-Broadway in 2013, where it stayed through its final performance in August of 2014. As more and more high school theatre departments showed interest in producing the musical, an abridged version was produced by the original writers that removed a lot of profanity, rewrote lyrics to songs, and did away with the overly sexual scenes, while still keeping the elements that make the show relatable to actual high school students. Having done shows such as “Mary Poppins,” “Les Miserables,” and “Fiddler on the Roof” in recent years, Director of Theatre Cathy Swain-Abrams said she wanted to do something more contemporary in order to give her students the widest range of experience as they entered college, should they continue to pursue a career in theatre. However, she was initially skeptical of the students who approached her about “Heathers,” but that changed after she saw the show performed at The Ohio State University last spring. For those who come to see the show, Swain-Abrams wants them to know that, while it is a dark comedy with many tough issues addressed that are very realistic to today’s student, it was also an opportunity for them to be educated on those issues. “We didn’t go into this lightly,” she said. “We spent a lot of time talking with our students, bringing in professionals to talk with them about the issues that are brought up in the show — violence, bullying, suicide, drinking and drug use — and using it as an educational piece and an opportunity to open up the conversation with our students. 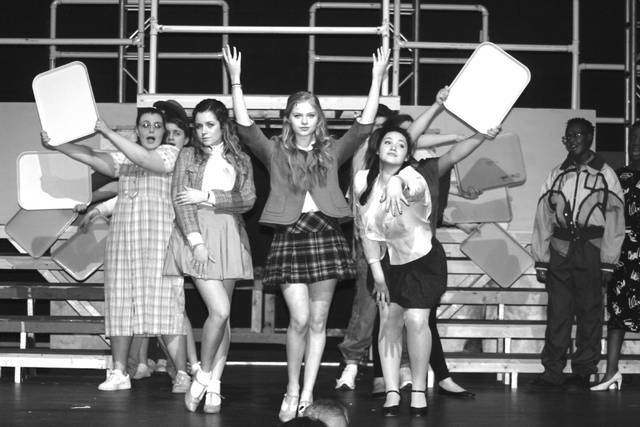 “Heathers: The Musical” opens on Thursday at 7 p.m. and will run through Sunday. The Friday and Saturday performances are also at 7 p.m., while the final show on Sunday will begin at 2 p.m.
Tickets are $12 for adults, and $8 for students and seniors if purchased at www.OOHSOH.booktix.com. Prices at the box office will go up to $15 and $10. There will also be a community forum on Friday evening, the 20th anniversary of the Columbine tragedy, after the show that will feature people from HelpLine of Delaware. The public is encouraged to come speak on the matters on display in the musical, as well as all issues today’s students face.